Large Intestine Meridian / Channel Acupuncture Points. This meridian contains 20 acupoints in one side, that is 40 acupoints in total. Location: On the radial side of the index finger, about 0.1 cun posterior to the corner of the nail. Indications: Toothache, sore throat, swelling of the submandibular region, numbness of fingers, febrile diseases with anhidrosis, loss of consciousness. Acupuncture Method: Puncture 0.1 inch, or prick the point to cause bleeding. Vasculature: The arterial and venous network formed by the dorsal digital arteries and veins. 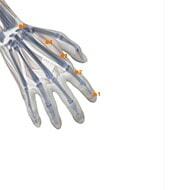 Innervation: The palmar digital proprial nerve derived from the median nerve. Indications: Blurring of vision, Epistaxis, toothache, sore throat, febrile diseases. Acupuncture Method: Puncture perpendicularly 0.2-0.3 inch. Moxibustion is applicable. Vasculature: The dorsal digital and plamar digital propria 1 arteries and veins derived from the radial artery and vein. 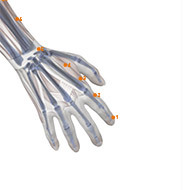 Innervation: The dorsal digital nerve of the radial nerve, and the palmar digital proprial nerve of the median nerve. Indications: Toothache, ophthalmalgia, sore throat, redness and swelling of fingers and the dorsum of the hand. Vasculature: The dorsal venous network of the hand and the branch of the first dorsal metacarpal artery. 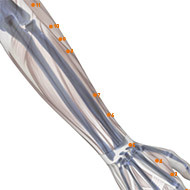 Innervation: The superficial ramus of the radial nerve. 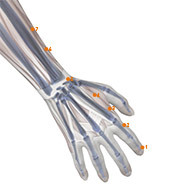 Location: On the dorsum of the hand, between the 1st and 2nd metacarpal bones; approximately in the middle of the 2nd metacarpal bone on the radial side. Indications: Headache, pain in the neck, redness, swelling and pain of the eye, epistaxis, nasal obstruction, rhinorrhea, toothache, deafness, swelling of the face, sore throat, parotitis, trismus, facial paralysis, febrile diseases with anhidrosis, hidrosis, abdominal pain, dysentery, constipation, amenorrhea, delayed labour, infantile convulsion, pain, weakness and motor impairment of the upper limbs. Acupuncture Method: Puncture perpendicularly 0.5-1 inch. Moxibustion is applicable. Acupuncture and moxibustion are contraindicated in pregnant women. Vasculature: The venous network of the dorsum of the hand. 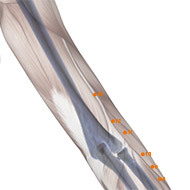 Location: On the radial side of the wrist. 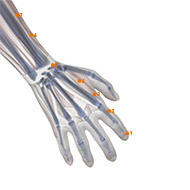 When the thumb is tilted upward, it is in the depression between the tendons of m. extensor pollicis longus and brevis. Indications: Headache, redness, pain and swelling of the eye, toothache, sore throat, pain of the wrist. Vasculature: The cephalic vein, the radial artery and its dorsal carpal branch. 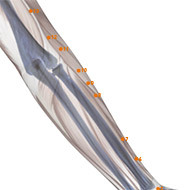 Location: With the elbow flexed and the radial side of arm upward, the point is on the line joining Yangxi (LI-5) and Quchi (LI-11), 3 cun above the crease of the wrist. Indications: Redness of the eye, tinnitus, deafness, epistaxis, aching of the hand and arm, sore throat, edema. Acupuncture Method: Puncture perpendicularly or obliquely 0.5-0.8 inch. Moxibustion is applicable. 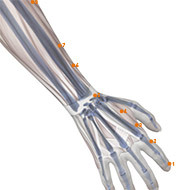 Innervation: On the radial side, the lateral antebrachial cutaneous nerve and the superficial ramus of the radial nerve; on the ulnar side, the posterior antebrachial cutaneous nerve and the posterior antebrachial interosseous nerve. 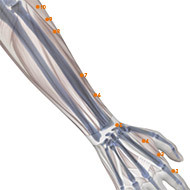 Location: With the elbow flexed and the radial side of arm upward, the point is on the line connecting Yangxi (LI-5) and Quchi (LI-11), 5 cun above the crease of the wrist. 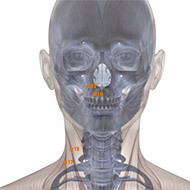 Indications: Headache, swelling of the face, sore throat, borborygmus, abdominal pain, aching of the shoulder and arm. Vasculature: The muscular branch of the radial artery, the cephalic vein. Innervation: The posterior antebrachial cutaneous nerve and the deep ramus of the radial nerve. Location: On the line joining Yangxi (LI-5) and Quchi (LI-11), 4 cun below the cubital crease. Indications: Abdominal pain, borborygmus, pain in the elbow and arm, motor impairment of the upper limbs. Location: On the line joining Yangxi (LI-5) and Quchi (LI-11), 3 cun below the cubital crease. Indications: Aching of the shoulder and arm, motor impairment of the upper limbs, numbness of the hand and arm, borborygmus, abdominal pain. Regional anatomy: See Wenliu (LI-7). Location: On the line joining Yangxi (LI-5) and Quchi (LI-11), 2 cun below the cubital crease. Indications: Abdominal pain, diarrhea, toothache, swelling of the cheek, motor impairment of the upper limbs, pain in the shoulder and back. Vasculature: The branches of the radial recurrent artery and vein. 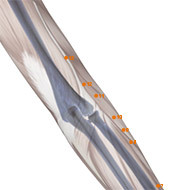 Location: When the elbow is flexed, the point is in the depression at the lateral end of the transverse cubital crease, midway between Chize (LU-5) and the lateral epicondyle of the humerus. Acupuncture Method: Puncture perpendicularly 1.0-1.5 inches. Moxibustion is applicable. Innervation: The posterior antebrachial cutaneous nerve; deeper, on the medial side, the radial nerve. 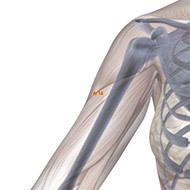 Location: When the elbow is flexed, the point is on the lateral side of the upper arm, 1 cun above Quchi (LI-11), on the border of humerus. 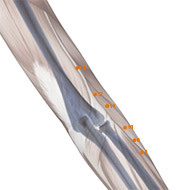 Indications: Pain, numbness and contracture of the elbow and arm. Vasculature: The radial collateral artery and vein. Location: On the lateral side of the upper arm, on the line connecting Quchi (LI-11) and Jianyu (LI-15), 3 cun above Quchi (LI-11). Indications: Contracture and pain of the elbow and arm, scrofula. Acupuncture Method: Puncture perpendicularly 0.5-1.0 inch. Avoid injuring the artery. Innervation: The posterior antebrachial cutaneous nerve; deeper, the radial nerve. 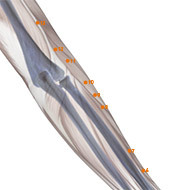 Location: On the lateral side of the upper arm, on the line joining Quchi (LI-11) and Jianyu (LI-15), 7 cun above Quchi (LI-11), at the insertion of m. deltoideus. Indications: Pain in the shoulder and arm, rigidity of the neck, scrofula. Acupuncture Method: Puncture perpendicularly or obliquely upward 0.8-1.5 inches. Moxibustion is applicable. Vasculature: The branches of posterior circumflex humeral artery and vein, the deep brachial artery and vein. Innervation: The posterior brachial cutaneous nerve; deeper, the radial nerve. 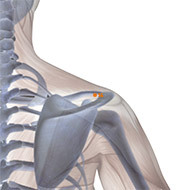 Location: Antero-inferior to the acromion, on the upper portion of m. deltoideus. When the arm is in full abduction, the point is in the depression appearing at the anterior border of the acromioclavicular joint. Indications: Pain in the shoulder and arm, motor impairment of the upper extremities, rubella, scrofula. Acupuncture Method: Puncture perpendicularly or obliquely 0.8-1.5 inches. Moxibustion is applicable. Vasculature: The posterior circumflex artery and vein. Innervation: The lateral supraclavicular nerve and axillary nerve. Location: In the upper aspect of the shoulder, in the depression between the acromial extremity of the clavicle and the scapular spine. Vasculature: Deeper, the suprascapular artery and vein. Innervation: Superficially, the lateral supraclavicular nerve, the branch of the accessory nerve; deeper, the suprascapular nerve. 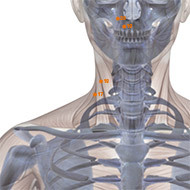 Location: On the lateral side of the neck, at the posterior border of sternocleidomastoid muscle, beside the laryngeal protuberance, at the midpoint of the line connecting Futu (LI-18) and Quepen (ST-12). Indications: Sudden loss of voice, sore throat, scrofula, goiter. Vasculature: The external jugular vein. 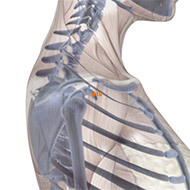 Innervation: Superficially, the supraclavicular nerve. It is on the posterior border of m. sternocleido- mastoideus just where the cutaneous cervical nerve emerges. Deeper, the phrenic nerve. 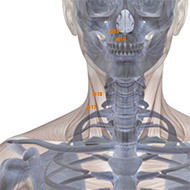 Location: On the lateral side of the neck, level with the tip of Adam’s apple, between the sternal head and clavicular head of m. sternocleidomastoideus. Indications: Cough, asthma, sore throat, sudden loss of voice, scrofula, goiter. Vasculature: Deeper, on the medial side, the ascending cervical artery and vein. Innervation: The great auricular nerve, cutaneous cervical nerve, lesser occipital nerve and accessory nerve. Location: Right below the lateral margin of the nostril, level with Renzhong (Shuigou, GV-26). 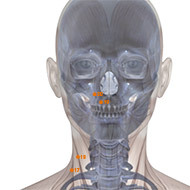 Indications: Nasal obstruction, epistaxis, deviation of the mouth. Acupuncture Method: Puncture obliquely 0.2-0.3 inch. Vasculature: The superior labial branches of the facial artery and vein. Innervation: The anastomotic branch of the facial nerve and the infraorbital nerve. Location: In the nasolabial groove, at the level of the midpoint of the lateral border of ala nasi. Indications: Nasal obstruction, hyposmia, epistaxis, rhinorrhea, deviation of the mouth, itching and swelling of the face. Acupuncture Method: Puncture obliquely or subcutaneously 0.3-0.5 inch. Vasculature: The facial artery and vein, the branches of the infraorbital artery and vein. Innervation: The anastomotic branch of the facial and infraorbital nerves. 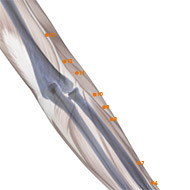 This meridian originates from the radial tip of the index finger (Shangyang, LI-1). It ascends through Hegu (LI-4), runs upwards along the anterior border of the lateral side of the upper limb to the shoulder, and emerges from the anterior edge of the acromion, where it goes back to the seventh cervical vertebra (Dazhui, GV-14). Then descending, from the supraclavicular fossa (Quepen, ST-12) enters the thoracic cavity to link with the lung. Then, passing through the diaphragm, it enters the large intestine to which it pertains.